We are very excited to announce that Portuguese dancers David Afonso and Cátia Fonseca are coming to Nijmegen to teach a weekend workshop! They will be here on Saturday 18th and Sunday 19th March 2017 as part of our Lindy Three anniversary celebration of Lindy Hop in Nijmegen. David and Cátia are very experienced dancers and international teachers. This won’t be their first time in the Netherlands, they were teaching in Utrecht just last year; Simon spent a week learning from them at Swing Summit in France last summer and was immediately captivated by their dancing and teaching style, their energy and their infectious sense of humour! 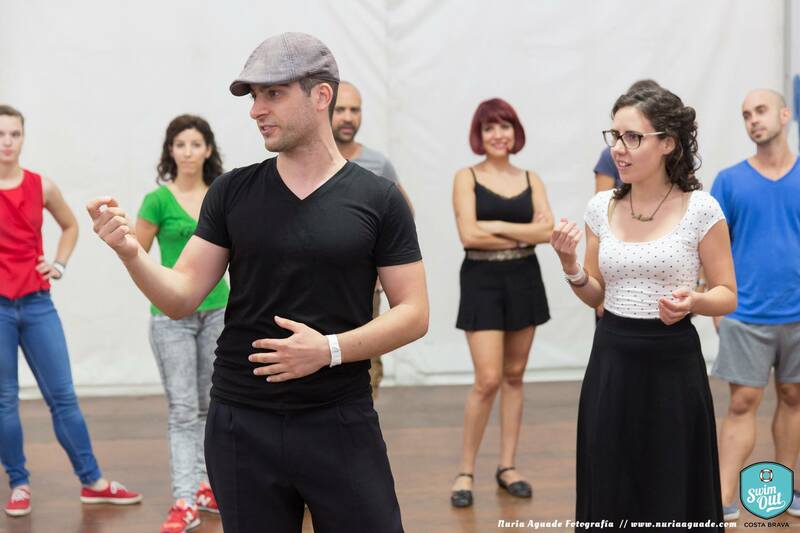 David and Cátia will use their experience and enthusiasm to create some class content that will help you to take your Lindy Hop to the next level. There will be three levels of classes, each consisting of three hours of classes. There will be a party on the Saturday evening with live music and a tea dance on the Sunday. We can’t wait to welcome you all in Nijmegen! If you’re not sure which track to take (since everybody progresses at their own rate), please feel free to send us an email and ask. You can of course take more than one track. This is a track for people who have been dancing Lindy Hop for three months to one year, i.e. for those who have some experience of dancing Lindy Hop and are ready to learn more. In Nijmegen this is equivalent to having danced regularly in Lindy A or Lindy B classes. You have some experience of six and eight count moves and you come social dancing as often as you can. Here you will strengthen your fundamentals, as well as add a few new moves and tricks to spice up your repertoire. This is not a class for absolute beginners. This is a track for people with at least six months to two years of dancing Lindy Hop. In Nijmegen this is equivalent to having danced regularly in Lindy B or Lindy C classes. You can comfortably mix your six and eight count steps and your Charleston moves. You know a few variations on these figures, although maybe you find this tricky when the music gets a bit faster. Most importantly, you are comfortable and content on the social dance floor; you come dancing at every opportunity and perhaps have been social dancing outside your usual Lindy scene! This is for people with at least two years’ experience of dancing Lindy Hop. In Nijmegen this is equivalent to having danced regularly in Lindy C classes (and higher). You go dancing whenever you can and you can’t get enough! You are growing in confidence in your leading/following and you love to interact with your partner. Perhaps you have been to some workshops with some international teachers. Most of all, you are in complete control of your basics and so now you enjoy to challenge yourself. Time to geek out!